Wiggins, of Toronto, is the son of ex-NBA player Mitchell Wiggins and former Canadian Olympic sprinter Marita Payne. 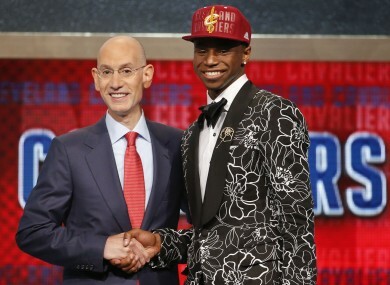 NBA Commissioner Adam Silver, left, congratulates Andrew Wiggins of Kansas. THE CLEVELAND CAVALIERS dipped into the Canadian talent pool for the second-straight year by making Andrew Wiggins the top pick in the National Basketball Association’s entry draft last night. Wiggins’ selection comes one year after the Cavaliers took his Canadian compatriot Anthony Bennett with the first-overall pick. American forward Jabari Parker went to the Milwaukee Bucks with the number two pick, while the Philadelphia 76ers took Cameroon centre Joel Embiid third overall. Orlando took power forward Aaron Gordon at number four and Utah selected Australian shooting guard Dante Exum fifth. The entry draft, held at the Barclays Center arena which is the home of the Brooklyn Nets, is the annual selection of college players that helps NBA teams replenish their rosters. The Cavaliers picked number one again after winning last month’s draft lottery as a longshot. “I always wanted to be the number one pick, but I knew come draft night you never know what to expect,” said Kansas freshman Wiggins. The Sacramento Kings also took Canadian guard Nik Stauskas eighth overall, with four of the top eight picks being international players. Phoenix selected guard Tyler Ennis, of Toronto, with the 18th overall pick. Exum, who will turn 19 next month, is not as well known as some of the other prospects because he decided to skip going to a US college and enter the draft. Oklahoma State guard Marcus Smart went sixth to Boston, forward Julius Randle was taken seventh by the Los Angeles Lakers, Charlotte took Indiana’s Noah Vonleh ninth and Philadelphia rounded out the top 10 by selecting guard Elfrid Payton. Embiid wasn’t at the Barclays Center because of an injury, but he tweeted a picture of himself smiling. “Couldn’t be happier to be a 76er!! !” he wrote. Parker, 19, scored 19.1 points and grabbed 8.7 rebounds per game for Duke University and said he thinks he can contribute right away for a young Bucks team. “I feel like I’m going to be able to grow with that organisation and I’m trying to be a throwback player, only stick with one team,” said Parker. Denver traded the No. 11 pick — Creighton star Doug McDermott — to Chicago for the 16th and 19th selections this year. Email “Cavaliers choose Canada's Wiggins with first pick”. Feedback on “Cavaliers choose Canada's Wiggins with first pick”.